1. Watch the following video of a debate in the House of Commons. There are strict rules about where the camera aims (at the current person speaking). 2. Describe the behaviour of the MPs that most people would call "misbehaviour". 3. Also, what is the issue being debated? What other issues become part of the debate? Voting Records for MPs. Attendance of MPs is not publicly accessible information - only the records of their votes. 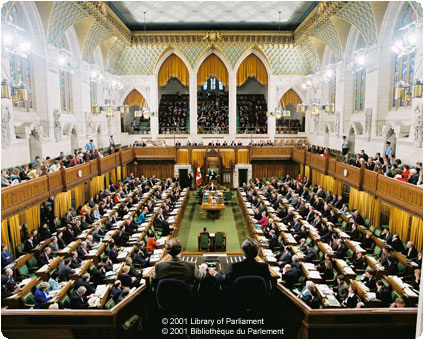 MPs may just show up for the votes or they may have to miss a vote due to other business.... MPs may also make an agreement between two opposing MPs (whose votes would cancel each other out) to not show up for a vote (However, that type of agreement has not happened lately). Also note that Justin Trudeau's vote record made a nosedive from roughly 82% present before running for Liberal Leader to 64% absent during the Leadership Race. 1. Note the attendance for the best three MPs and the worst three MPs. 2. In some countries, parliamentary attendance is taken every day and MPs have their pay cut accordingly. The US does not take attendance either.. Give 1 reason why attendance should be taken and 1 reason why it should not be taken. 1. Some citizens have set up private webpages to monitor the behaviour/actions of MPs. For instance, here's the web page for our local MP, Rick Norlock. a. What are the advantages and disadvantages of private webpages such as this one? a. Rick Mercer gives credit to Stephen Harper for being the first Prime Minister to do what? b. What misbehaviours does Mercer identify in the House of Commons? c. Why does Mercer think webcams would be a solution? d. In a well written paragraph, explain why you agree or disagree with Mercer's idea. Support your opinion with 3 reasons followed by examples.